This family-friendly Siem Reap villa is located in the historical district, within a 15-minute walk of Charles de Gaulle Road, Angkor Archaeological Park, and Killing Fields Memorial. Pub Street and Angkor Wat are also within 3 mi (5 km). This villa features a full-service spa, a restaurant, and an outdoor pool. Free full breakfast is provided, as well as free WiFi in public areas, free valet parking, and a free airport shuttle. Additionally, a swim-up bar, a coffee shop/café, and a 24-hour business center are onsite. All 8 individually decorated villas feature free WiFi and DVD players. Conveniences include refrigerators and coffee makers, and guests will appreciate thoughtful touches like bathrobes and slippers. 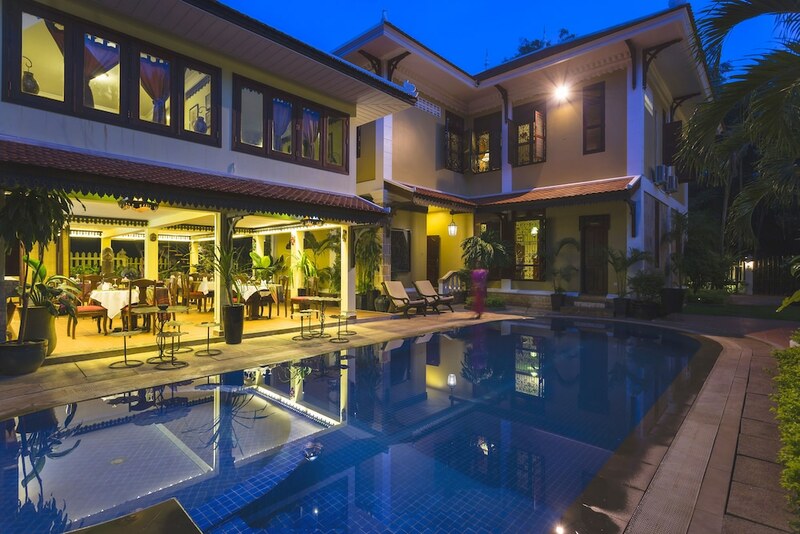 In addition to a full-service spa, HanumanAlaya Colonial House features an outdoor pool and a children's pool. Dining options at the villa include a restaurant and a coffee shop/café. A swim-up bar is on site where guests can unwind with a drink. Guests can enjoy a complimentary breakfast each morning. A computer station is located on site and wireless Internet access is complimentary. Business-related amenities at this 3.5-star property consist of a 24-hour business center and limo/town car service. This Art Deco villa also offers spa services, a library, and a terrace. An area shuttle within 2.5 km and a roundtrip airport shuttle (available 24 hours) are complimentary for guests. Onsite self parking and valet parking are complimentary. A total renovation of this property was completed in April 2016. HanumanAlaya Colonial House has designated areas for smoking. A complimentary full breakfast is served each morning between 6:30 AM and 10 AM. Colonial Café - This poolside restaurant specializes in local and international cuisine and serves breakfast, lunch, dinner, and light fare. Guests can order drinks at the bar and enjoy alfresco dining (weather permitting). A children's menu is available. Happy hour is offered. Open daily. Colonial Bar - Overlooking the pool, this cocktail bar specializes in local and international cuisine and serves breakfast, lunch, dinner, and light fare. Open daily. Start your day with a free full breakfast, available daily from 6:30 AM to 10 AM. Room service is available during limited hours. SITA SPA has 2 treatment rooms including rooms for couples and outdoor treatment areas. Services include deep-tissue massages, hot stone massages, facials, and body wraps. A variety of treatment therapies are provided, including aromatherapy. The spa is equipped with a steam room. Public bath/onsen services include an outdoor public bath (no mineral springs). The spa is open daily. Guests under 10 years old are not allowed in the spa. Rollaway/extra beds are available for USD 27.0 per night. This property offers transfers from the airport. Guests must contact the property with arrival details 72 hours prior to arrival, using the contact information on the booking confirmation. Reservations are required for massage services. Reservations can be made by contacting the villa prior to arrival, using the contact information on the booking confirmation. Only registered guests are allowed in the guestrooms. The property has connecting/adjoining rooms, which are subject to availability and can be requested by contacting the property using the number on the booking confirmation. No pets and no service animals are allowed at this property.